As the walkout by teachers in Oklahoma enters its second week, a coordinated large-scale effort by school administrators and community organizations to provide free lunch and daycare may prove critical to their success. Oklahoma City elementary school teacher Madeline Scott told her students about the statewide teacher walkout on the last day of classes before it began on April 2. Their reaction surprised her. “Will there be food for all of us?” he asked. Scott assured him there would. Since Monday last week, thousands of Oklahoma teachers in at least 50 school districts have refused to work until the Oklahoma Legislature gives them a $10,000 raise, a $5,000 raise for support staff and $200 million in additional education funding. Each day, hundreds of schools have closed. Days before the walkout, the legislature passed a $6,000 teacher pay raise. Teachers said it wasn’t sufficient. On Friday, lawmakers passed two additional tax bills that generate $42 million in education funding, though the legislature also repealed a hotel tax that raised $47 million as part of the original pay-raise measure. The Oklahoma Education Association, the top union in the state, vowed to continue the walkout this week, urging the legislature to raise an estimated $100 million through the closure of a capital gains tax loophole. Despite widespread school closures, districts have supplied meals to students and connected them with daycare providers. In West Virginia, striking teachers paid out of pocket to buy food and deliver it to students. But in Oklahoma, school administrators have coordinated a large-scale effort, in collaboration with community organizations, to help vulnerable children and their families. The provision of these services shows how the teachers’ bosses — superintendents, school boards and principals — have quietly bolstered the teachers as they enter a potentially lengthy standoff with the Republican-controlled legislature. Oklahoma’s education establishment has supported its teachers, said Nelson Lichtenstein, a professor of labor studies at University of California, Santa Barbara. “In that sense it’s not just a movement of the employees, but their employers,” he said. Across Oklahoma, 62 percent of public school students are eligible for free or reduced lunch, which amounts to 366,000 kids. Due to high student poverty levels, Oklahoma City Public Schools and Tulsa Public Schools, the two largest districts in the state, qualify for a federal program that subsidizes free breakfast and lunch for every student. The state ranks 43rd in food insecurity, the proportion of households who at a given time do not know the source of their next meal. On March 7, the Oklahoma Education Association announced a teacher walkout scheduled for April 2. That gave schools almost a month to prepare for a possible closure. “We immediately began collaborating with our faith and nonprofit community,” said Deborah Gist, the superintendent of the Tulsa school district. Throughout the walkout, thousands of teachers have stormed the capitol, and over a hundred are in the midst of a seven-day 110-mile march from Tulsa to Oklahoma City. But as the walkout enters its second week, these meal and daycare offerings may prove crucial for preserving community support. Since the walkout began, at least 150 sites in Tulsa are providing food and other services for the 41,000 students in Tulsa Public Schools and thousands more in neighboring districts. In the Oklahoma City school district, 107 bus drivers are taking 40,000 meals each day to over 70 sites, said Kaye, the superintendent. “School buses will act like a mobile food delivery unit,” she said. “They will deliver sack lunches at one site, pick up more and go to another site. It’s a really massive undertaking.” Kaye is holding a nightly conference call to make adjustments as needed. 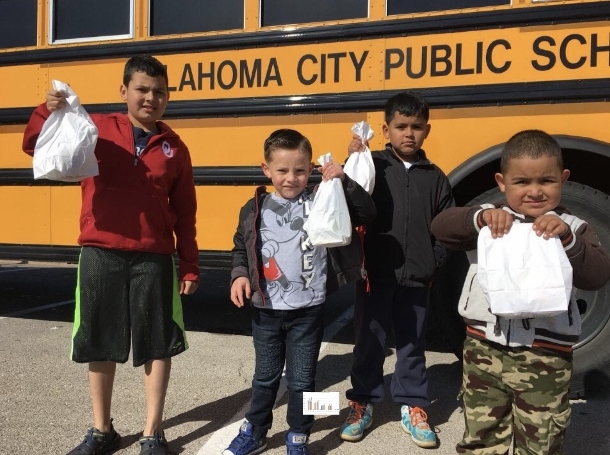 In the Oklahoma City school district, bus drivers and cafeteria workers are not walking out; they are delivering and serving these meals, Kaye said. Many other school districts have coordinated meals for students, including districts in rural areas such as Clinton Public Schools, in western Oklahoma. “In smaller districts with less capacity there’s an even greater need,” Fitzgerald said. She explained that her organization, which serves an area that spans two-thirds of the state, has spent $300,000 to put together a network of between 15 and 20 hot meal sites, as well as a fleet of trucks that deliver 20,000 boxes of food over 14 days. Each box contains pasta, mac and cheese, peanut butter, canned fruits and vegetables, tuna, Vienna sausage and milk, among other items. If the walkout lasts more than two weeks, each additional day will cost the group $25,000, Fitzgerald said. The Oklahoma school district posted a list of 40 community organizations that offer daycare, of which 16 are free and open to all children. One of the free providers, Henderson Hills Baptist Church, signed up almost 200 students. “The demand from parents has been overwhelming,” Pastor Chris Wehunt said. “Our website shut down.” Students attend a morning service, followed by bible study and camp-style games. Representatives of Oklahoma Regional Food Bank and Henderson Hills Baptist Church said their organizations do not side with or against the teachers. “We’re here for the kids,” said Wehunt. The teachers have not set an end-date for the walkout. But Kaye acknowledged that she and her colleagues don’t want to spend long running a food service operation.